Woodside is, perhaps, best known by NYC commuters as a major interchange of the Long Island Rail Road — the only other station in addition to Pennsylvania Station where all major points in Long Island can be directly accessed (except of course for Flatbush Avenue in Brooklyn). It was first settled by Europeans in the 1640s, but remained largely rural in nature until 1869, when developer Benjamin Hitchcock purchased the estate of John A. Kelly, divided it into lots, laid out streets, and brought in other developers and industry. Kelly, for his part, had already given Woodside its name from a series of letters written from his room, which had a view of the woods out the window. The LIRR arrived in 1895, trolleys plied the main routes, and Woodside, which has somewhat nebulous boundaries (Woodside Avenue on the west, Northern Boulevard on the north, Mount Zion Cemetery and 51st Avenue on the south and the New York Connecting Railroad on the east, was folded into Queens’ overall numerical street nomenclature in the 1920s. 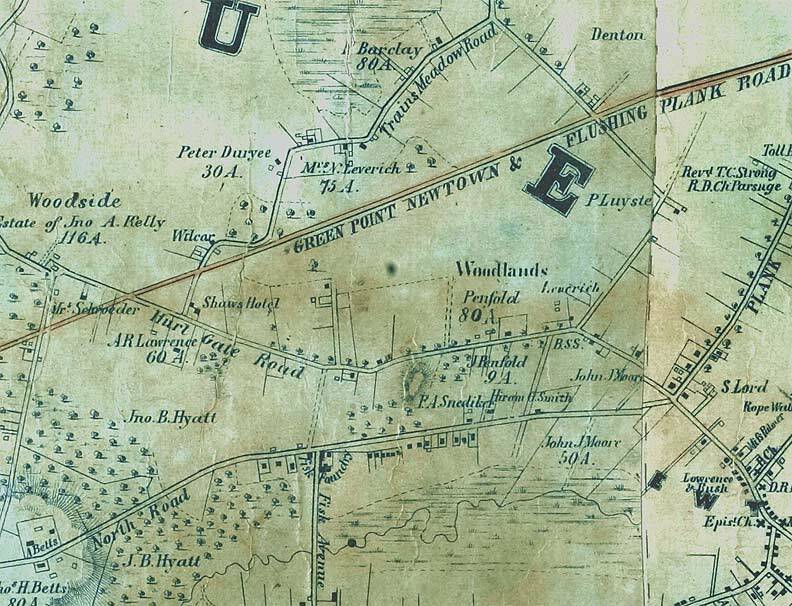 This segment from an 1852 map depicts Woodside from before Hitchcock divided his lots. Amazingly, most of the roads depicted here still survive and even some of the names and structures echo down to this day. In the mid-19th Century, most Queens roads were farm to market roads, or led to East River ferries. Logically, the shortest route between two points is a straight line, but in a 3-D world, topography plays a role, and roads zigged around hills and zagged around ponds or other bodies of water. At top left the estate of John A. Kelly is clearly marked. The crossroads of Hurl Gate (a corruption of Hell Gate Road) and the Greenpoint, Newtown and Flushing Plank Road (today’s Roosevelt Avenue) exists today as a major transit hub. The elevated to Flushing, today’s #7 train, was built over it between 1917 and 1928. Hurl Gate Road makes up today’s Woodside Avenue, but also, at its eastern end, Broadway as it curves south to meet Queens Boulevard and Grand Avenue at what used to be the heart of Newtown but is today’s Elmhurst. The “S. Lord” shown at its east end is the estate of British immigrant Samuel Lord, the co-founder of the Lord and Taylor retail empire. He built four mansions for his four daughters on Claremont Terrace, which survives only as a dirt road dead end on Dongan Avenue off Broadway. No one there today guesses its connection with Lord & Taylor! 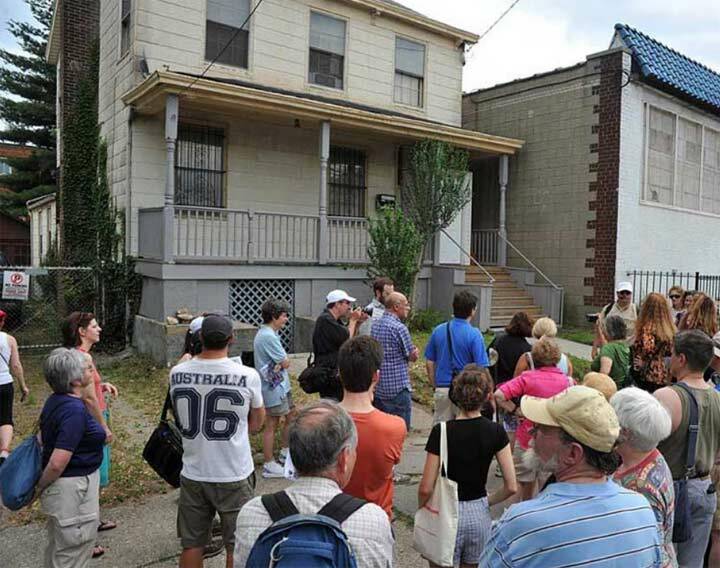 A few years ago I led a Forgotten NY tour in Woodside and stopped at a small, nondescript porched building in need of repairs. Many historians believe this is the Shaw’s Hotel, depicted on Hurl Gate Road on today’s 64th Street just east of the junction with the Greenpoint plank road. Time hasn’t been kind to Shaw’s Hotel on 64th Street north of Woodside Avenue, hard by the Long Island Rail Road main branch. A couple of years ago, a huge condominium was constructed just inches away from it on the corner of the two cross streets. The owner recently made several upgrades, the most notable being a large picture window on the 2nd floor that looks out onto the LIRR/Roosevelt Avenue El transit complex. 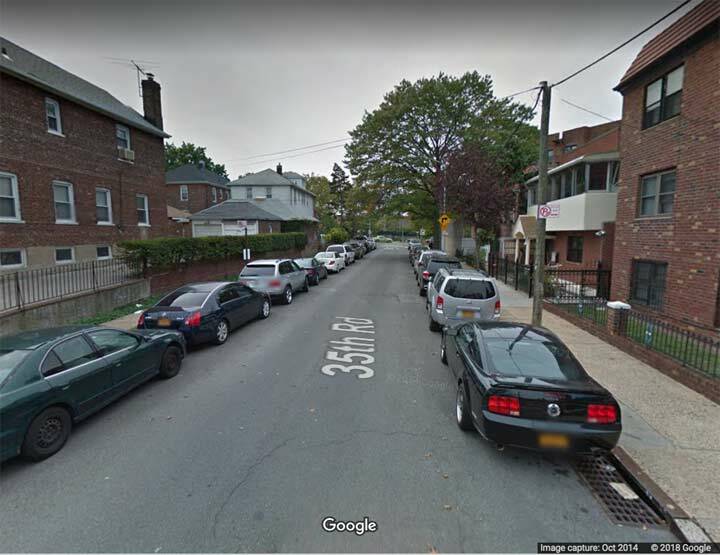 It originally was owned and operated by Woodside innkeeper Benjamin Shaw at what was then the confluence of Woodside Avenue, an old road going back to the colonial era and before, and the vanished Trains Meadow Road, once the only diagonal road through what is now Jackson Heights. In 1842, Shaw was awarded a large tract formerly belonging to the Palmer family by an auction ordered by a court action: the parcel was about 50 acres in size. Shaw built three houses on his land, the present one seen here the survivor to the present day. After Shaw’s death in 1856 the land was further subdivided and auctioned to highest bidders. Eventualy, by the early 20th Century, streets were mapped out and built, and memories of Trains Meadow Road and Benjamin Shaw and his hotel slipped from memory. 35th Road between 69th and 71st Streets. As far as I can discern this is the only remaining section of Trains Meadow Road, which before 1920 or so, twisted and turned from Hurl Gate Road in a general northeast direction through what is now Jackson Heights, When the Queensboro Corporation built palatial apartments and laid out a street grid in the 1920s, most traces of Trains Meadow Road disappeared. There were no railroad tracks when Trains Meadows Road was named during the colonial era– the name is likely from a property owner, or even corrupted from a Native American name. The John B. Hyatt referenced on the left side was a mid-19th Century property owner. 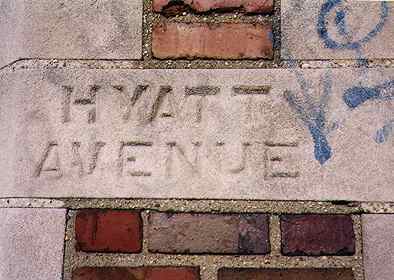 When 65th Place, a major north-south route, was extended through it was originally called Hyatt Avenue. The name survives on a pair of recently-renovated signposts marking the Ridgewood Plateau development on 65th Place and Jay Avenue. 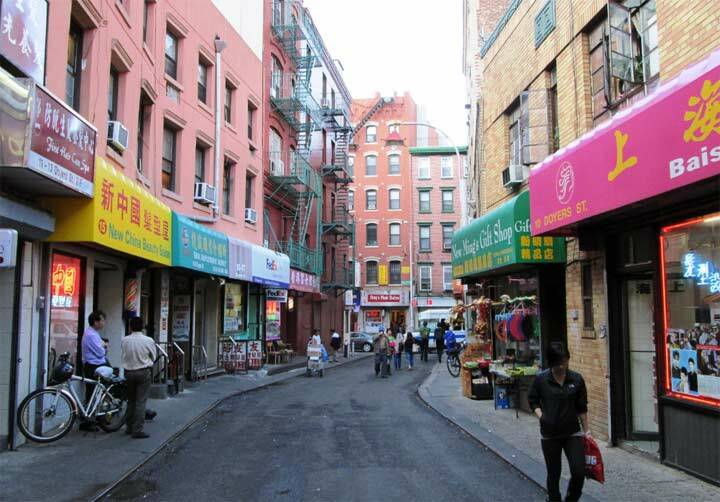 Fisk Avenue, which existed as long ago as 1852, is today’s 69th Street. The old “Fisk Avenue” name is still marked, for the sake of tradition alone, on modern platform signs on the 69th Street/Fisk Avenue station of the #7 line. Finally, the Betts family shown lower left is remembered today by the tiny Betts Cemetery, which was later absorbed into Mount Zion Cemetery. 58th Street, shown by a north-south line, was Betts Avenue. Mt. Zion was built in 1893 surrounding the Betts family burial plot; Captain Richard (1613-1713) and wife Joanna’s home stood at the southwest corner of territory now surrounded by the cemetery. It was razed in 1899. According to legend, Captain Richard Betts dug his own grave in the Betts family plot a few days before he died. His grave is not detectable but many of his descendants’ are. Interesting to see the Leverich property- Leverich street still exists for one block. Also the Luyster property, whose name still exists in Luyster creek. Railroad service arrived at Woodside in 1864, when Flushing and North Side RR was formed and linked with the LIRR near today’s Woodside. The LIRR eventually absorbed the Flushing and North Side which is today’s Port Washington Branch. The link below, to the excellent Arrt’s Arrchives site, gives more details and photos. The current station dates to around 1915 and resulted from a relocation of the LIRR right-of-way and the building of the IRT along Roosevelt Avenue at about the same time.